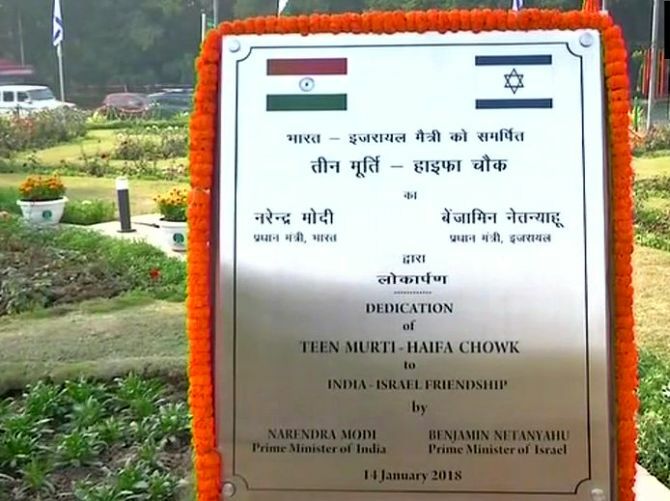 Teen Murti Chowk in central Delhi was formally rechristened as Teen Murti-Haifa Chowk in a ceremony attended by Prime Minister Narendra Modi and his Israeli counterpart Benjamin Netanyahu on Sunday. The two leaders also laid a wreath and signed the visitor’s book at the memorial. In the visitor’s book, Modi wrote that he saluted the “great Indian traditions of selfless sacrifice and penance” of Indian soldiers, who laid down their lives during the liberation of the city of Haifa and the First World War. “One of these pages was written 100 years ago, in the sacrifice of Indian soldiers at Haifa. The sacrifice commemorated at Teen Murti observes its centenary. Naming this spot as Teen Murti-Haifa Chowk marks this historic occasion. In the presence of the prime minister of Israel, we pay homage to the brave soldiers,” Modi wrote in the visitor’s book. Netanyahu, who arrived on a six-day visit on Sunday, was received by Modi at the airport, setting aside protocol. The brigade carried out the victorious assault on the fortified city of Haifa on September 23, 1918, during the World War I. There are various accounts of this battle - all narrate the valour with which the lancers undertook the assault on the garrisoned city protected by a joint force of Ottomans, Germany and Austria-Hungary. The liberation of Haifa cleared a supply route for the Allies to the city through the sea. Forty-four Indian soldiers made the ultimate sacrifice during the liberation of the city in the World War I.
Till date, the 61 Cavalry celebrates September 23 as its Raising Day or “Haifa Day”.